From the small village of Oberndorf near Salzburg, the world’s most famous Christmas carol has spread around the globe. Learn about the humble and most charming story of its creation. Without this song, Christmas would only be half as beautiful. Which is why Oberndorf is filled with such an inimitable Advent atmosphere, with the world-famous Christmas song “Silent Night!” taking center stage. Nothing beats standing in front of the „Silent Night, Holy Night“ memorial chapel in Oberndorf on Christmas Eve and joining hundreds from all over the world in the singing of the Christmas carol in its original version. You’ll feel a chill when you join the chorus singing a song which spread from this very spot to the entire world! The local priest, Josef Mohr, wrote the words (the original version is "Stille Nacht, heilige Nacht", in German) in 1816 and Franz Xaver Gruber composed the famous tune two years later. 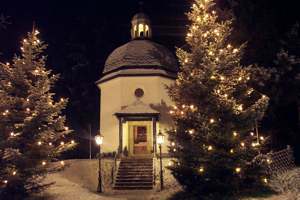 The song was first performed on Christmas Eve 1818 at the Saint Nicholas Parish Chapel in Oberndorf. Near the memorial chapel and the idyllic Christmas market on Silent Night Square, you’ll find the Gruber-Mohr memorial and an exhibit about the history of “Silent Night” in the local museum. Oberndorf is about ½ hour by car/bus outside of Salzburg and you’ll want to take a photo in front of the small chapel. Further villages like Wagrain, Mariapfarr and Hallein host Silent Night museums, sights and special events as they were places of activity of the composers.